Seasons change and so do nail color trends. When summer ends, we bid adieu to bright, neon and pastel polishes and welcome the deep, dark shades of fall. 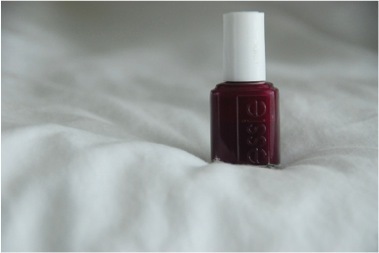 However, one color compliments almost every outfit in any season: Essie’s Bahama Mama. The rich plum paint is my personal favorite and a constant must-have in your wardrobe of polishes. Its darker shade makes it seem like a fall color at first, but after one coat you’ll realize the versatile potential of that little glass bottle’s content. Because the polish has a purple hue rather than the typical brown, burgundy and blacks of cooler seasons, you can easily wear it in warmer weather. The name itself makes you want to pack your bags and head to the tropics! Still not convinced? Here are a couple tips to pulling off this darker polish in hotter seasons. Let’s start with jewelry. Go for silver or platinum baubles for a brighter match. Gold can sometimes seem heavy, and it may give off a wintry appearance when coupled with Bahama Mama. Silver tones present a lighter look that compliment it best in sunnier seasons. Consider your makeup, too. You might not think your face has anything to do with your nails, but this polish paired with heavy makeup can give you an overall chilly appearance. When sporting Bahama Mama in spring or summer, keep your shadows subtle and your lips light with more natural tones. Complete your look with a chic outfit for the warmer weather, and your nails will surely compliment your style. Note: While it may seem obvious that Bahama Mama works wonderfully for the cooler seasons, there are still ways to jazz it up even more! As leaves change from summer to fall, consider pairing your polish with gold or brass jewelry and jewel-toned outfits. In terms of makeup, you have more leeway. Take advantage of deep colors in the cold for a rich look that will certainly turn heads. Don’t forget to stock up on your Bahama Mama collection because no matter what time of the year, you can always rock this captivating color with confidence.